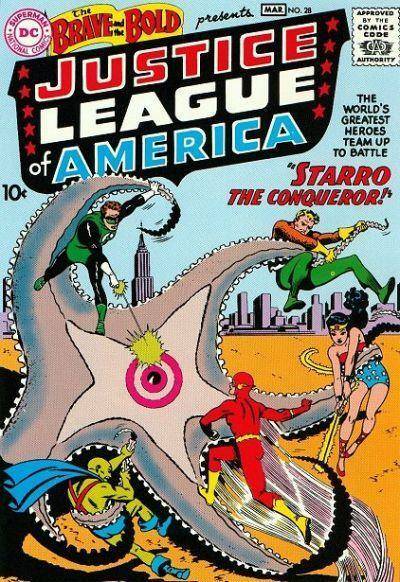 The Echinoblog: Starfish Feeding!! : When Starfish Capture MOVING Prey! Starfish Feeding!! : When Starfish Capture MOVING Prey! 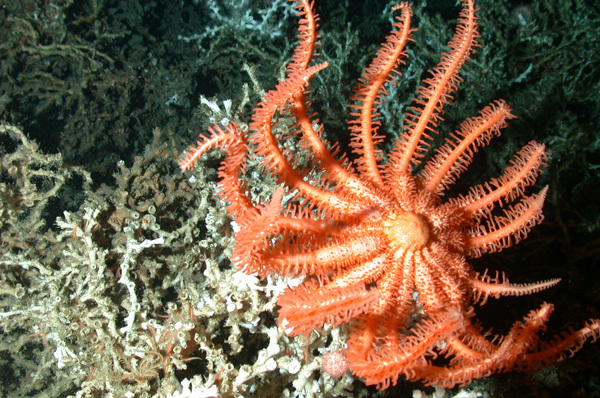 Earlier this week I wrote about the many different ways that starfish EAT. Well, one of the big shocks to most people is when I tell them that many species of the ever-humble sea star don't just settle for frakkin' mussels and clams..they actually GOES for the big, moving prey! shrimps, fishes and..????? For a starfish, Stegnaster has a really odd feeding mode. It sits up on its tippy toes as seen above and pretends to be a cave or some other crevice. Following the diagram above, once some small prey has situated itself inside the "cave" with the body lifted above on its arm tips (A), followed by the star then slowly closing off the edges (C and D) until finally whatever is inside gets trapped and the cardiac stomach drops on the hapless prey (E)!! digesting it alive!! According to Anthoni's Seafriends page this is effective not only against shrimps and snails, but also seahorses and other small fishes!!! Active Predators When I say active, I mean, they actually use a specific structure for feeding on and obtaining prey....Many of these species practice some kind of bottom-water column type feeding. 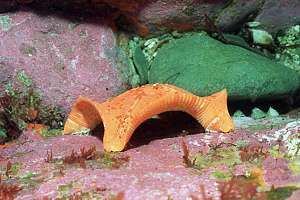 Probably one of the first sea stars to be observed feeding or catching moving prey, this animal gained notoriety quickly as being the "fish eating" starfish. The surface of this fairly large animal (diameter gets up to almost 1.5 feet across!) are covered with fairly large pedicellariae (teeth-like jaws) with many big jagged hooks that are deployed on batteries around all of the spines and are deployed as big grabby claws whenever food is detected. 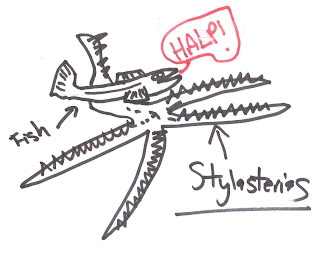 I suspect that the Styla part of Stylasterias refers to "stylet"alluding to the sharp spines on the body surface. 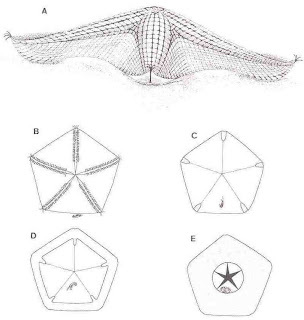 These animals live off the west coast of North America in fairly deep-water (about 100-800 m) and were the among the most recently reported to feed on mobile prey in a cool paper by Lynn Lauerman who observed them with ROVs and had many great opportunities to collect and watch them alive. These handsome animals were named for Dr. Richard Rathbun, a curator of crustaceans at the Smithsonian National Museum of Natural History. I wonder if Walter K. Fisher (who named the genus and species) realized that they fed on crustaceans when he named the starfish for him! Although they have opportunistic tendencies (they don't always feed on mobile crustaceans) they do show a very strong propensity for eating things that swim by them..
To feed on krill as they go swimming by it. Prey get held fast by these jagged jaws and are dragged down to the mouth where they are eaten alive! Aieee!! 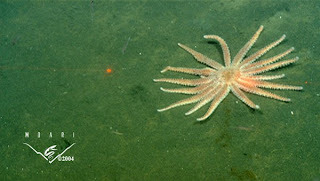 Shown here is Novodinia antillensis from the NOAA explorer site) Taken by S. Brooke. I wrote a much more involved post about these neat animals here. 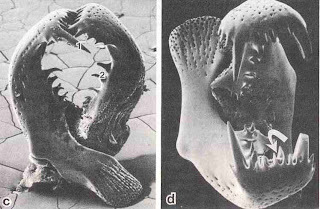 But, but the short version is that brisingid asteroids are suspension feeders/predators that feed by using pedicellariae all over their arm spines to capture prey as the water current takes food through their arm "feeding basket" providing foodstuffs to be captured on the arm spines. The YouTube Echinoblog Video Playlist !! 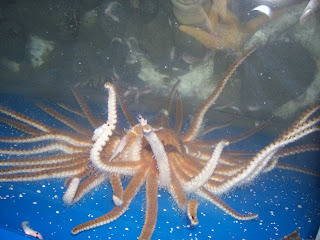 The World's BIGGEST Brittle Stars!!! The Secret Lives of Feather Stars REVEALED! !